With over five decades of sound engineering skills poured into the design of these babies, the AH-D1200 is an artfully designed set of headphones which offers high resolution sound and ergonomic construction of the highest quality. The standout features all rally around design and durability. Denon understands that audiophiles want to take their music with them (everywhere) and the Denon AH-D1200 headphones are built for showing off. Made from strong materials to keep up with your lifestyle, not only is the contemporary styling and modern design going to turn heads wherever you go, but you also won’t miss a beat with the three-button remote on the cable which provides seamless control for volume functions and the microphone. This is easy listening at its! A durable aluminium die cast hanger houses the ear cups of the Denon AH-D1200, giving you great lasting quality and swivel flexibility for easy storage. Don’t worry about wear and tear either. The premium engineered leather on these headphones are twice as strong as any similar offering and built to withstand extensive use and still look and perform as new. 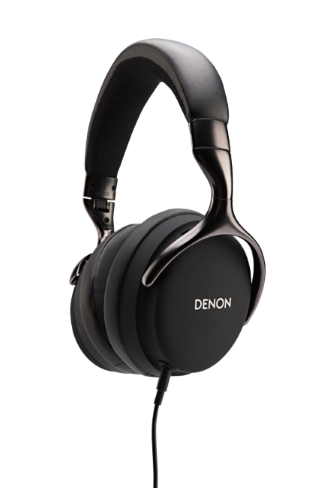 The Denon AH-D1200 headphones are designed in Japan, and constructed from materials chosen for rigidity and low mass. Tuned for the outdoors, the 50-mm drivers in the Denon AH-D1200 do away with unwanted echoes and distortion, leaving you with accurate, detailed, all-immersive sound. This is largely thanks to the drivers sitting on vibration-reducing engineering baffles. The result is, as we said, the purest possible sound for your listening pleasure. If music is your life, then you want to be comfortable around it all the time. Headphones, especially, need to be built for extended use and stay comfortable for as long as you need to listen to your favourite tunes. The Denon AH-D1200 features ergonomic construction with over-ear memory foam ear pads and a lightweight, comfortable fit. In fact, they are so comfy that you may even forget that you’re wearing them. That tedious train commute to work just got a whole lot more exciting with the Denon AH-D1200 headphones, which you can rely on to deliver unrivalled sound in exquisite comfort. On the go or lounging next to the pool, you will always have premium sound at the touch of a button. When you get to your destination (work) and have to zone into another world for the working day, just pop your headphones into the foldable carrying pouch for easy, safe storage… until home time when you can slip them back on again for hours of listening bliss. Another feature not to compromise on when choosing a set of headphones is the audio support. Denon’s AH-D1200 headphones’ high-resolution audio support lets you fully enjoy your favourite playlists. Also, the free Denon audio app provides you with the freedom to EQ music exactly the way you want to. It’s about enjoying music as it was meant to be heard, whether it’s to soothe the soul or get you pumped.